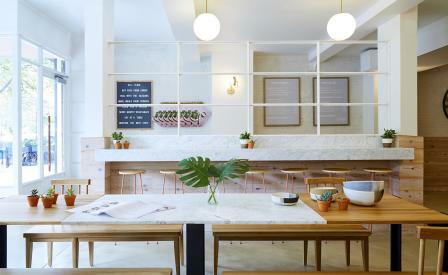 The growing, health-oriented restaurant chain Dig Inn, has taken its nutritious offering to Boston with an appropriately stylish home designed by ASH NYC. Situated amongst the historic facades that characterise Boylston Street, Dig Inn’s first outpost outside of New York City features a reinvention of the eatery’s well known aesthetic. Working in a palette of pink, peach and grey, the firm has brought a design-forward touch to match the restaurant’s ingredient-focused approach with a mix of white oak seating, blackened steel accents and white marble countertops. Armed with both indoor and outdoor seating, the 3,000 sq ft space is laid out in an open concept, serving breakfast, lunch and dinner made from ingredients provided by local farmers throughout the day. Communal dining is also at the heart of the concept, with plenty of shared tables available for both eating and working. Custom-made furniture brings a well-heeled edge to the restaurant’s airy, convivial interior.